We encourage all riders of all ages to RIDE RIGHT. Always wear an approved helmet. Stop at all stop signs and take a good look at all intersections. Be on the lookout for vehicles. Ride for pure recreation and exercise or ride for your transportation needs. Only ride on City Streets that you feel comfortable. Parents are encouraged to work with youth and designate specific routes and time of day to ride. Routes shall be determined by age and skill level of riding. 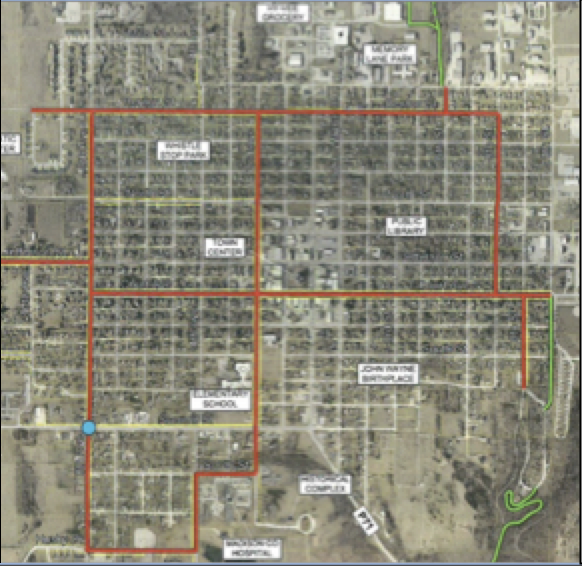 For example- a younger child should not ride alone through downtown Winterset during the day but choose a route around the square or walk bike a few blocks. An adult should be more than capable of riding on any City Street. The shared lanes will mean different things to various riders. West on Court Ave, then north on 8th Ave, then east on Benton St., then south on 8th Street and back to Court Ave. The EAST/WEST Loop is the most popular because it has minimum stops along the way and is very flat, approximately 2.5 miles in length. To extend this loop, take Court Ave all the way out of town to the east (past M.M. Sports Fields, dog park, and quarry) to the stop sign and then turn around and come back to town adding another 2 miles. North on 8th Ave, east on Benton St., south on 2nd Ave, (short jog on Hutchings St. and then 4th Ave), west on Husky Drive and back to 8th Ave. The NORTH/SOUTH Loop has more stops and a few more hills along the way, approximately 2.5 miles.